Americans say high gas prices have already affected their behavior – and they expect prices to rise even higher, especially as a result of Hurricane Katrina. That concern and a worsening perception of the war in Iraq appear to have dragged President Bush's approval rating down to 41 percent, matching the lowest level ever seen in this poll. For the first time in years, concerns about gas and oil prices now ranks among the top concerns when Americans are asked to volunteer the most important problem facing the country. It is now the number two issue, after the war in Iraq and ahead of the economy. While Americans blame oil companies and oil producing nations more than they blame the President and the war in Iraq for high gas prices, 63 percent think that the President can do something about high gas prices. Assessments of the Iraq war are near their lowest points ever. The percentage saying things are going well for the U.S. has dropped 8 points in the last month. Americans are much more pessimistic about the future of Iraq than they were earlier this year after the Iraqi elections or shortly after the fall of Baghdad. Forty-eight percent now say Iraq will NEVER be a stable democracy. Given a choice, Americans would at least decrease the number of troops in Iraq; nearly three in ten would remove all of them now. Hurricane Katrina and its aftermath is a growing public concern. Five percent of Americans ranked that as the country's most important problem. That number increased every day of interviewing for this poll. Rising oil prices have already had a broad impact across America. Nearly nine in 10 Americans say the higher prices have affected them, including 62 percent who say they have been affected a lot. AFFECTED BY HIGHER GAS PRICES? Majorities of Americans in all demographic groups, including those with the highest incomes, say they have been affected a lot by rising gas prices. Democrats are more likely than Republicans to say they have been adversely affected. Those with incomes under $30,000 a year and those with a high school education or less are among the most affected. 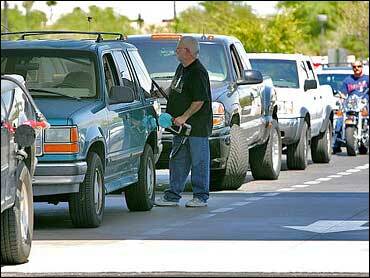 The recent increase in gas prices has put the issue among the top concerns of the American public. When asked to volunteer the most important problem facing the country, Americans name the war in Iraq (24 percent), followed by, for the first time in years, gas and oil (14 percent). This represents a sharp change from just a few weeks ago, when only 3 percent mentioned higher gas prices as the most important problem. The economy and jobs is third, mentioned by 13 percent. Concerns over rising gas and oil prices are shared across party lines. Twenty percent of men name gas and oil concerns as their top concern, compared with fewer than one in 10 women. Five percent of Americans cited Hurricane Katrina and its aftermath as the country's most important problem – a number that may rise in future polling. Americans foresee no good news on the horizon about gas prices. More than eight in 10 Americans expect gas prices to go even higher as a result of Hurricane Katrina. Only one in 10 thinks Hurricane Katrina will have no effect on gas and oil prices. This poll was conducted just after Hurricane Katrina hit the U.S. Gulf coast. But even when Katrina is not mentioned in the question, 78% think gas prices will go up in the next few months, while just 12% think they will go down. Almost two-thirds of Americans say they have made changes in their behavior in response to the higher prices. When asked to volunteer what they've done, by far the largest change Americans spontaneously mention is cutting back on driving, volunteered by 40 percent. Seven percent volunteer that they didn't go on vacation or travel this summer, 4 percent are carpooling more, and 4 percent are taking mass transit. Three percent volunteer that they have bought or are thinking of buying a more fuel efficient car. When asked specifically whether they have done various things as a result of the higher gas prices, the numbers are higher. Seventy percent say they are driving less and nearly half have changed their household spending habits. Three in 10 changed their summer plans, and 22 percent are seriously considering buying a more fuel-efficient vehicle. Food and groceries, entertainment such as movies, and eating out are among the items people are spending less on. WHAT ARE YOU SPENDING LESS ON? Forty-three percent say they expect to make changes in their behavior in the face of even higher gas prices. Those changes are mostly more of what many have already been doing -- cutting back on driving, buying a more fuel efficient car, taking mass transit and cutting back on other spending. Most car owners think the gas mileage they get on their vehicle is good (38 percent) or average (49 percent), but they are filling up often -- eight in 10 buy gas at least once a week. And while 42% comparison shop for the cheapest gas prices, 52% continue to go to the gas station that is most convenient for them, even if it means paying a bit more. WHO SHOULD SHARE THE BLAME? American oil companies and oil producing countries get the most blame for rising gas and oil prices, with two in five Americans placing a lot of blame on them. But many also blame President Bush and the Iraq war. Just under one-third place a lot of blame on Bush and the war in Iraq, and an additional two in five blame them some. Additionally, three in ten say a lot of the blame is due to waste by consumers for the high prices, and half place some blame on consumer waste. When asked if they would blame anything or anyone else for the recent rise in gas and oil prices, 5 percent name U.S. oil companies, and 4 percent each name Congress and politicians, the Bush Administration, and U.S. consumer driving habits and SUVs. Few volunteered Hurricane Katrina. Although Americans are less likely to blame President Bush for high gas prices now, that issue could have a future impact on his ratings. Over six in 10 Americans expect a President can do a lot about rising gas prices, and just 27% say the price of gasoline is beyond any president's control. IS GASOLINE PRICE SOMETHING A PRESIDENT CAN DO A LOT ABOUT? Eight in 10 Democrats and six in 10 Independents say a President can do a lot about gasoline prices. Republicans are more likely to say gasoline prices are beyond any president's control. Nearly all of those who believe a president can do a lot about the price of gasoline blame President Bush either a lot or some for the rise in gas and oil prices. More Americans today than ever before are pessimistic about the eventual outcome in Iraq – and most would be willing to decrease the number of American troops there or remove troops altogether. Today just 40 percent say U.S. efforts to stabilize Iraq are going well, down sharply from last month, when 48 percent said this. Most Americans now see things going badly. But assessments of the war were even lower in spring 2004, after the Abu Ghraib abuse scandals. While few have ever thought the transition to democracy in Iraq would go quickly, today nearly half – 48 percent - think Iraq will never become a stable democracy at all. This pessimism has risen since February: then, shortly after the Iraqi elections, most Americans thought Iraqis would eventually achieve democracy, even if it took time. While most Americans would not withdraw all U.S. troops from Iraq now, most would like to see troop levels at least lowered. Twenty-nine percent would remove all troops now, while another 26 percent would like to see troop levels decreased. There is little support for increasing the number of troops. Many Americans don't believe there would be any impact on U.S. safety if troops left Iraq: 54 percent foresee no change to the terror threat against the United States if that happened. Thirty-two percent think removing troops would increase the threat, 11 percent think it would lower it. However, if the United States did withdraw, most think the violence in Iraq would continue at least at its current levels, or even increase. Americans don't believe the White House claim that the fighting in Iraq, and the effort to create a democracy there, has so far reduced the danger of terrorism to the United States. Four in ten say the threat of terror has stayed the same as a result of the U.S. action, and as many say it has increased the risk. Overall, most Americans don't think they're getting a true picture of the war effort from the President. Most – 57 percent - say President Bush makes the situation in Iraq sound better than it really is. Twenty-nine percent say Bush describes things accurately. Forty-nine percent now say that as they look back, the U.S. should have stayed out of Iraq entirely, while 45 percent say the United States did the right thing by sending troops there, numbers that have moved relatively little in the last year. The last time a majority of Americans said the Iraq action was the right thing to do was in October 2004, just before the Presidential election. Views on this question break along partisan lines, as they have throughout the war, with Democrats saying the United States should have stayed out while Republicans call it the right thing to have done. Just a third believes the results of the war have been worth its costs. Cindy Sheehan, whose son died in Iraq while serving in the Armed Forces, had been camping outside President Bush's ranch in Texas, asking to meet personally with the President. Many Americans report following the story very or somewhat closely. FOLLOWING NEWS OF CINDY SHEEHAN'S PROTEST? Overall, 39 percent say Bush should meet personally with Sheehan and 30% say he should not. These views split on partisan lines. Most Democrats say the President should meet with Sheehan, and most Republicans say he should not, or point out that they already met, in a gathering between Bush and a group of gold star families some time ago. Independents narrowly say Bush should grant Sheehan's request. Overall, views of Sheehan are split, with 27 percent viewing her favorably and 26 percent unfavorably. These perspectives also run along partisan lines. President Bush's overall approval rating now stands at 41 percent, a 4-point drop since early August, matching his lowest rating ever in this poll, amid poor perceptions of the war in Iraq and mounting concerns over high gas prices. Bush's approval ratings for his handling of Iraq and of the economy are both below 40 percent, and had small declines in the last month. However, both have been lower at other points in his Administration. Fifty-four percent now approve of the President's handling of the campaign against terrorism. Hurricane Katrina may give President Bush the opportunity to increase his low approval ratings. In fact, his overall rating did rise on the last day of the poll, after he returned to the White House from his ranch in Crawford, Texas, and addressed the nation on the crisis in the Gulf Coast. But in the early days of this crisis, many Americans are withholding judgment about his handling of it. Fifty-four percent approve of the way the President is handling Hurricane Katrina, and only 12 percent disapprove -- but one-third can't say yet. This question was added to the poll on Tuesday, the day after Hurricane Katrina hit the U.S. Gulf coast. Bush's current rating for his handling of Hurricane Katrina is actually lower than what his father, former president George H.W. Bush received for his handling of Hurricane Andrew. In September 1992, nearly two-thirds approved of then-President Bush's handling of Hurricane Andrew, while three in 10 disapproved -- but that poll was conducted nearly three weeks after Hurricane Andrew hit Florida. This poll was conducted among a nationwide random sample of 871 adults, interviewed by telephone August 29-31, 2005. The error due to sampling could be plus or minus three percentage points for results based on all adults. Error for subgroups is higher.For detailed information on how CBS News conducts public opinion surveys, click here.